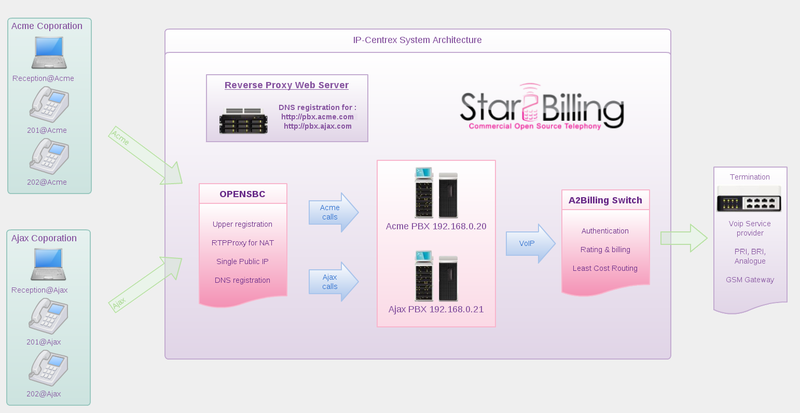 Axion Communications, based in California wanted to start providing hosted PBX services, and one of the first people Joey Cary, CEO of Axion contacted was Star2Billing. After detailed discussion about Joey’s requirements, we were able to recommend a solution and go on to build the infrastructure for both their IP-Centrex solution, providing hosted PBX systems, as well as providing the telecoms billing solution using A2Billing. We were fortunate in that Axion is a very technically adept company, and with guidance and support from us, they were able to adapt our solution to better suit their business model, but no company can afford to stand still, so their systems are still very much a work in progress as the system is fine tuned to give ever better results. Fortunately the design allows testing and changes to be made without affecting customer service. Axiom uses A2Billing for billing the minutes, and management of VoIP accounts, however, because the of the complex tax regime, and the flexibility of charging Axiom wishes to offer its customers, charges for services outside of minutes are done in their own integrated billing system. Joey told us that “...you enable us to bring a very robust, reliable, scalable solution to market very quickly, but it is still a work in progress.” The diagram below gives an overview of the proposed Axion Communications infrastructure.